There's been a lot of talk about tragedy lately. Whether it be gun violence, sexual assault on college campuses, domestic violence or the upcoming anniversary of the horrific tragedy that occurred in Newtown, Connecticut (my home state). One question that is glaringly missing from the conversations we've been hearing in the media and from elected officials is this: what do the families impacted by tragedy do when faced with going back to work? The current lack of both national and state paid family and medical leave would suggest that for those experiencing trauma, at some point, most likely soon after the traumatic event, they are faced with a decision about going back to work. It's safe to assume that those who are not well off and rely on their paychecks to pay their monthly bills, worry enormously about going back to their jobs before they are emotionally ready. In my opinion, it's morally wrong that after someone experiences a traumatic event they should have to worry about their job at all. Parents who have lost a child, women who have been assaulted, police officers and teachers who have faced an unimaginable situation like in Newtown, should at a minimum have peace of mind that they can take paid time off from work in order to heal. And not simply saved up vacation or sick time (not everyone has that anyway), but true paid family and medical leave that will give them time to grieve, seek help and do what they need to do to cope with whatever they've experienced. Here's the thing about traumatic life events -- they are completely unexpected. You can't possibly argue that someone should have saved up money in case of these kinds of situations because no one believes these things will happen to them. And while some employers will do the right thing and offer paid time off to their employees, others will not. It's up to the government to create a system of paid family and medical leave so that all employees know that if they experience some kind of tragedy, they won't risk losing their jobs or their incomes if they can't go back to work right away. While potential paid family and medical leave legislation would benefit all employees because it can be taken for a wide variety of reasons (like the birth of a child, your own serious illnesses or to care for an elderly parent) it's accessibility to those who are experiencing significant emotional and/or physical pain as the result of tragedy is of upmost importance. 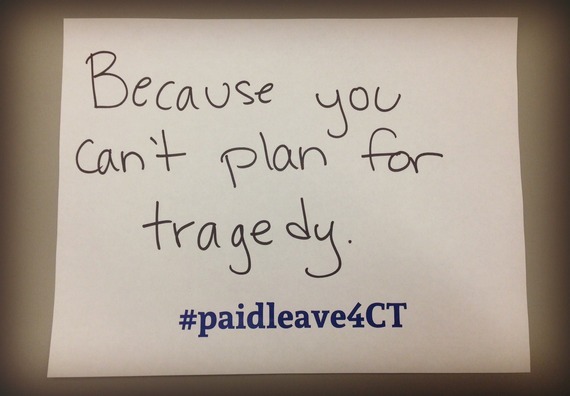 Connecticut, as well as several other states, is poised to introduce its first comprehensive paid family leave legislation during the upcoming 2015 legislative session. I hope that this particularly vulnerable population is kept top of mind as elected officials decide about whether or not to make this issue a priority. Individuals and families who have experienced trauma should not be forced to go back to work before they're ready. That's simply unacceptable. For more about Connecticut's paid family leave efforts visit paidfamilyleavect.org.